Restaurant kitchens have extremely high powered stoves, flames that jump so high that your eyebrows will singe just standing in the doorway. At home, especially with electric stovetops, we just can’t get that kind of heat. To compensate, you’ve got take the time to let your wok or pan get super hot and the best way to judge whether it’s hot enough is to hold your hand 6 inches over your wok. The moment you start feeling some serious heat, it’s ready. Seriously, though, don’t try to be all macho and stuff, if it’s hot enough for you to say, “hot!” just pull away. The second trick is to sear your meat or seafood first, remove from the wok, then cook the vegetables, and then returning the meat or seafood back to the wok towards the end of the stir fry. If you don’t, you’ll end up steaming your meat in the vegetable juices instead of frying it. You want each individual ingredient of a stir fry to sing on its own, instead of becoming a soggy, heavy, mish-mash. The last trick is a tough one. I know it’s a gut reaction to constantly keep poking, prodding and stirring during a stir fry (which is essential in a massively hot restaurant wok), but resist the urge when you’re frying meat or seafood. When you first put your meat in the wok, spread it out so that the pieces are not touching and use all available surface area. Now, step away! Let the meat have a chance to sear. If you keep messing with it, the protein never has a chance to develop that wonderful carmelization and you’ll end up with mushy meat. 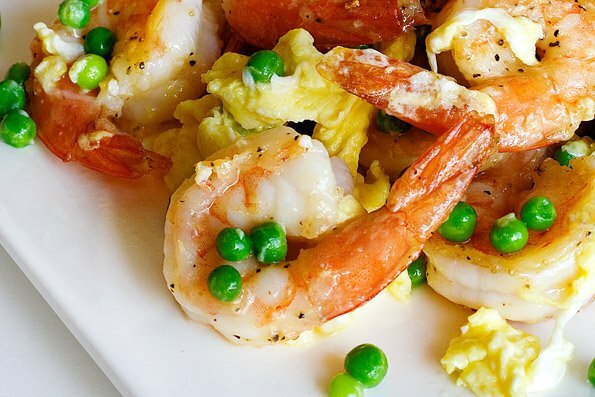 In this Stir Fried Shrimp, Eggs and Peas dish, you’ll practice all three of these secrets. You’ll let the oil heat up before adding the shrimp, spread out the shrimp so that they don’t touch and just let it sear. 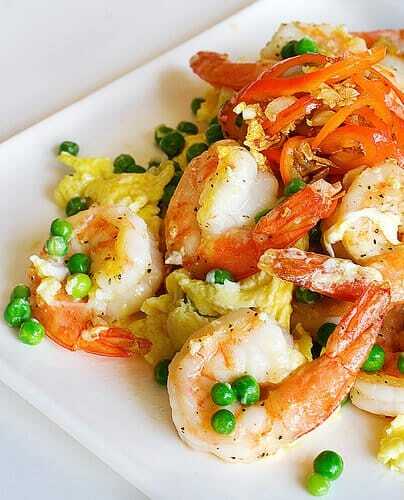 Once cooked, you’ll remove the shrimp and add it back in when the eggs are almost set. This will give you a light/firm/crisp/crunch/springy shrimp – a sure sign that you’ve cooked the shrimp properly. I always have a bag of frozen peas/carrots (and in this case just peas), some frozen shrimp and eggs on hand. When I’m cooking Chinese food and need just one more dish to make the meal complete, this is one of my go-to dishes. 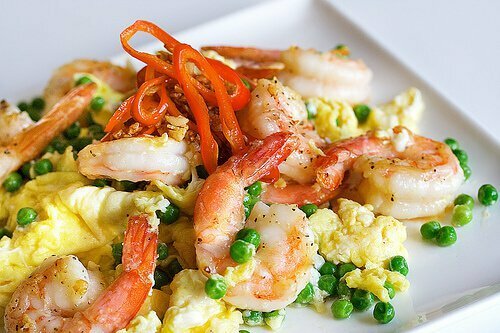 In this recipe for Stir Fried Shrimp, Eggs and Peas, I’ve chosen to fry the chilies and garlic separate from the eggs and shrimp, using it as a topping. This is because my kids are eating this dish too – and they can pick the parts where the chilies are not touching. I know you’ve been taught not to burn garlic, as it can be bitter and ruin the entire dish. But in this case, the garlic is fried to a crisp – it provides a wonderful texture. Since it’s a TOPPING – and not the base of the dish (i.e. I’m not cooking the garlic first and layering ingredients/flavors on top of the garlic) – the very slight bitterness is a welcome, especially nestled against the chili pepper’s sweet heat.